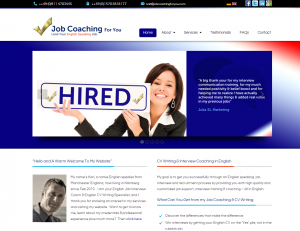 Jobcoachingforyou.com was founded in 2013 by Karl Dean, a native English speaker from Manchester but living in Nürnberg Germany since 2010. Karl’s created his concept and set his mission: To effectively guide and get his customers successfully through an English speaking job interview or recruitment process by providing high quality customized job seeking, job interview and English CV writing support. Part of Karl’s initial vision and goal was to create website which would market and offer his services and also provide job seekers throughout Germany and Europe with essential information and guidance on English job interviews, job seeking, CV’s and resumes. For this he needed a website designer and website programmer who valued and promoted flexibility, value for money, customer attention and focus, patience and most importantly trust and quality. In April 2013, Karl found the right person and procured the services of Warren Chandler. Effective Communication and increasing personal performance using NLP methodology.